WordPress WooCommerce Store Pickup Locator allows the admin to create different stores and allocates products and their quantity to them. The admin can add different physical stores along with the store address, zip code, store contact, etc. After adding the stores, the admin can add any product (newly added or previously available) to any of the stores. The customer can search for stores using city name or zip code and all the nearby stores will be shown. The admin can add their physical stores. The admin can enable, disable, edit, and delete any of its stores. Product assignment is simple to their physical store. The admin can allow Store Pickup for their products. It supports Home delivery of products as well. The admin can set the quantity/availability for the products. 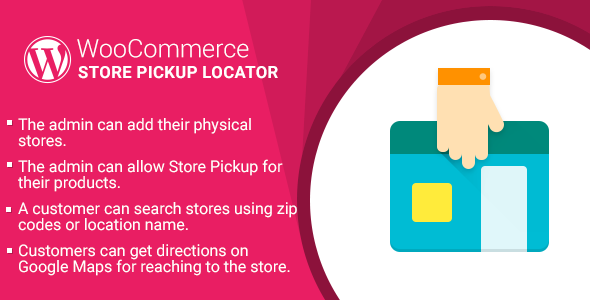 A customer can search stores using zip codes or location name. Searched store results are visible on the Google Map to the customer. A customer can check for product availability on any store.